← Exercise of the Week… Extra Steps! A warm peppermint hot chocolate with whip cream, warms your frozen hands on a cold winter day, as you are bundled up in a winter coat and hat. With each sip you feel the warmth of the beverage spread from your fingertips to your toes. What you don’t feel is the soreness from that extra hour of jogging you will have to do, to burn that extra 450 calories, 54 grams of sugar and 13 grams of fat, that you just sipped away in a matter of minutes. During the holidays so many of us get so excited for that special holiday drink, that we only consume during the Christmas season! Although these beverages are full of Christmas flavors and cheer, they are also full of calories and sugar that we never seem to account for. One of my clients this week has been working extremely hard and was determined to continue to lose weight though the holiday season. She had been exercising each day for an hour, been keeping track of her food choices, following the Rule of 3s at social events and overall make wonderful food choices. With all that hard work this past 6 week the scale had not budge 1 ounce. She was defeated in our session, and could not understand “why?”, especially with all this hard work. We took a step back in the session and looked closely at her intake. I noticed something different; her usual venti coffee with milk (about 120 calories) turned into a Eggnog Latte with nonfat milk. 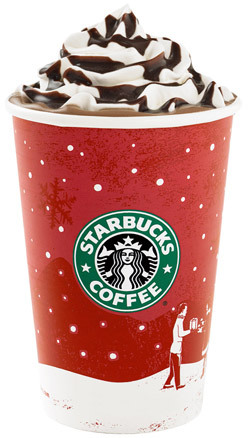 When I asked her about this, she said “oh, for the month of December I always switch my coffee to something festive. It is just a coffee with some steamed milk and eggnog flavor”. Well we took a look at the nutrition information online and we both nearly fell off our chair. Her “just a coffee with some steamed milk and eggnog flavor” was a whooping 570 calories and 63 grams of sugar! She would need to go to the gym and extra hour and a half per day to burn off all those calories or she could have eaten 2 full size Snickers bars for the same amount of calories and less sugar! Another example of us knowing something is not a great choice from a calorie standpoint, but we all had no idea it could be that bad! Awareness is the key to avoiding, too many high calorie beverage trap. Moderation with these types of beverages and a few of my pointers and solutions below can help. Give them a try, Cheers! One for One: Every time you order an alcoholic beverage, you should match it with a calorie free beverage (seltzer water, club soda with splash of cranberry juice or a water with lemon or diet soda). It is a great way to slow down your alcohol consumption. Sneak Peek: Most of our favorite coffee stops list all the nutritional information for their seasonal beverages (Starbucks Nutrition Facts & Dunkin Donuts). Take a look ahead of time. 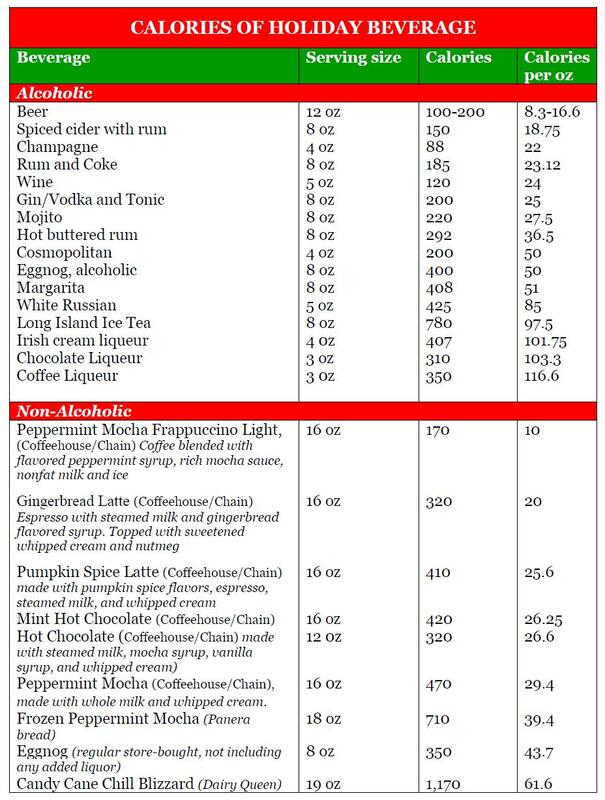 Pick the beverages and portion sizes that have a reasonable amount of calories. My rule of thumb if it is more than 250 calories it is not worth it! Simple Swap: Look at suttle ways to trim calories from your beverage selection. Example switch from cream to whole milk or even skim. When you order you hot chocolate pick nonfat milk instead of whole. Instead of ordering Large/Venti try a Small/Tall beverage size. Instead of tonic water with your vodka or gin, try soda water with some fresh lemon or lime. 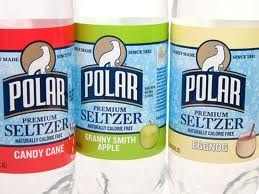 (1) Polar Seltzer Collection of Seasonal Flavor-ites. These fall and winter flavored seltzers provided that Christmas cheer with zero calories! I loved the Eggnog and Candy Cane. Other flavors include Granny Smith Apple, Cinnamon, and Pumpkin Spice. Great on their own or to use making a Christmas cocktail. (2) Homemade Hot Chocolate. Snack Girl has a great, simple recipe for hot chocolate using almond milk, but you could make this even with soy or skim milk. During the holidays you can add peppermint extract or a cinnamon stick to get that holiday flavor without added sugar. (3) Skinny Cocktails. The Skinnygirl Cocktails new flavor white cranberry cosmo is my new favorite holiday cocktail. I served this at a holiday gathering recently, garnished with some frozen cranberries, it was the hit of the party. 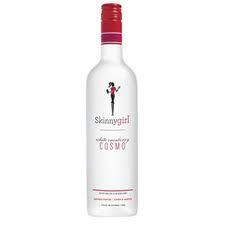 4 ounces of the Skinnygirl White Cranberry Cocktails has less than 100 calories for 4 oz, that is 1/2 the calories of your usually Cosmo. You can also Google “skinny cocktails” and a laundry list of great ideas and recipes for making your favorite holiday cocktail low calorie! This entry was posted in Alcohol, Beverages, Mindful Eating, Social Eating, Uncategorized and tagged food choices, Holiday, holiday drink, hot chocolate, Skinny Girl, Snack Girl, Social Eating, Starbucks. Bookmark the permalink.